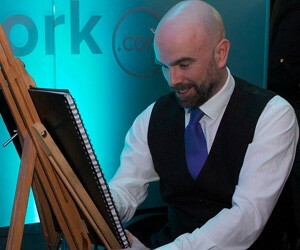 Allan Cavanagh - Caricature Artist Ireland for Gifts, Weddings & Events! Caricature Artist Ireland: I’m caricature artist Allan Cavanagh and I have drawn thousands of caricatures which have ended up all over the world. With over 20 years experience, whether you’re looking for live caricature entertainment for your wedding, staff party, or product launch, or you’re looking for gift caricatures for birthdays, retirements or wedding presents, I’m your man! To order a caricature simply click here! To see many of the thousands of caricatures I have drawn please check out and like my Facebook page!